The traditional Brick walls, are time consuming wile erection and needs a costly maintenance. Our Precast Concrete Boundary Walls are the right choice to overcome these traditional brick walls. Our Precast concrete boundary walls are fast and easy to construct and have a virtually unlimited life. These walls are low maintenance and do not deteriorate with time. Tekla is a BIM software used for creating steel and concrete structures. It helps engineers to build 3D models for creating structural steel, concrete, rebar and miscellaneous steel components. The precast concrete structure is the one which is cast/ molded in a factory and transported on-site. Steel Construction Detailing Pvt. 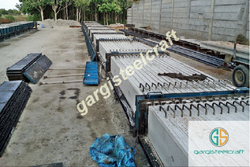 We are used to build Precast Concrete Walls .